Forget the Trump, 2015 has been one helluva year for pontification on big disruptive, and occasionally ridiculous topics. Anything robotics, artificial intelligence, the end of work, the end of sanity... the end of pretty much anything has been bandied around. Hence, it was refreshing to bring together a host of service buyers and providers in Harvard last week, to dial back into planet earth and really get to the point of where we need to take things. 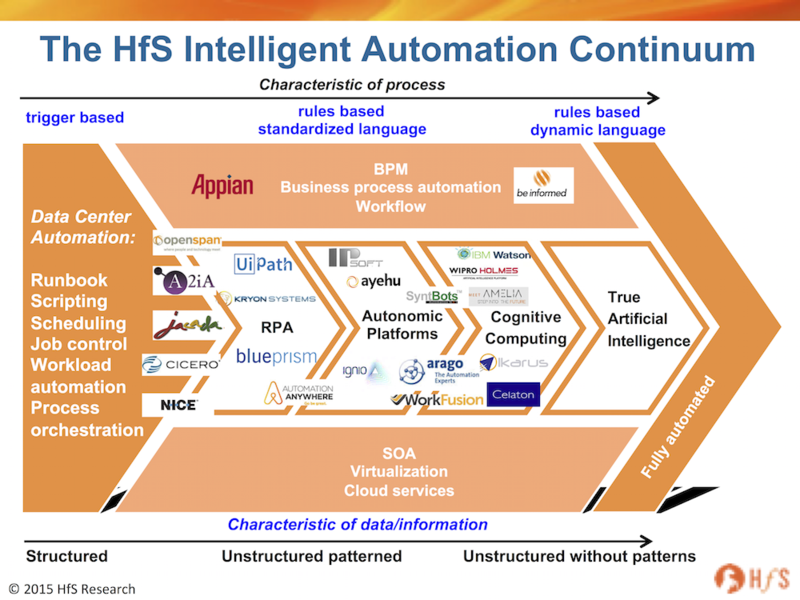 I've been reading some interesting arguments that discuss separating RPA out from the more intelligent developments further along the Continuum. And they're half right, but I also argue they're half short-sighted too. The best comparable is BPO, where we are going to see most RPA deployments, as many service buyers seek to eke out more productivity from their messy processes, which they didn't quite get right the first time around. And why - pray tell - did so many BPO buyers not do enough that first time around? Why is our industry literally littered with hundreds pf underperforming BPO contracts that are caught in a purgatory of status quo, where the provider has no desire to change anything and simply keep pumping home their predictable profit margins from a pre-set provision of offshore FTEs, while their buyers have long-lost the attention of their CFOs to get renewed investments to make their processes run better. Why is it that so many BPO buyers only enjoyed some "transformation" during their brief 18-24 month transition towards a BPO steady-state, before their service provider packed up the Visio charts and redeployed their process wonks to work on that next deal coming down the pipe? The answer is simple - most BPO buyers only focused on getting that initial 30-40% of cost out the door. They were not thinking beyond that. They did not budget or create a real plan for achieving ongoing process improvements and innovations, once they reached that steady state of lower cost. And it's the same with RPA and cognitive - focusing only on the short-term cost is only going to get you so far. So learn from that experience to make a broader business case for an intelligent automation journey right from the onset. RPA is only the first step on a journey of self-learning, self-healing, dynamic process creation and really smart decision making support for your business. Don't ring-fence it... embed it in a broader program of Intelligent Automation. This is the most sensible article I have read on RPA for a long while. I totally agree that focusing only on rudimentary automation and ignoring the broader, longer term benefits of cognitive and AI is similar to what happened in the past with outsourcing deals that never delivered anything beyond some labour savings. We need to look further ahead than short term savings! Excellent piece, Phil. This is the perennial problem with leadership mindsets today - initiatives like RPA are treated like "flavors of the month", as opposed to a longer term plan for real business value. We've got to get out of this mindset of businesses investing only for short term cost gains from labor reductions, and think more about making their labor forces smarter, as opposed to simply making them smaller. You nailed it Phil. Couldn't have articulated this better myself. I agree 100%. Without a strategy to look at a long term benefit which focuses on continuous improvement not only through RPA but cognitive methods , it would be very difficult to achieve anything moe than 40% of cost or effort efficiency. Also it is important to continuously identify the areas of automation as more and more of unstructured data into the system will need a different approach to look at standard processes. 9 'Phil, I agree' comments and no counterviews yet? Hindsight makes us feel like gods. Do we really believe that the CFOs, COOs and CIOs of large corporations (need to) understand the interplay of processes, technology and businesses? When an organization chose a certain degree of automation when it implemented ERP 20 years ago, it was really a commercial rather than a technological decision. With more dollars, it could have probably got a different mix of technology and humans. But why should they have done that? Analysts have cottoned on to RPA after 15 years as though this is a magic wand. Why blame the CXOs? More importantly why should a BPO client put money into the Intelligent Automation space when it could focus on its business and go with the right vendor who comes up on top in the near future. Are they in the business of technology or are they using technology for business? 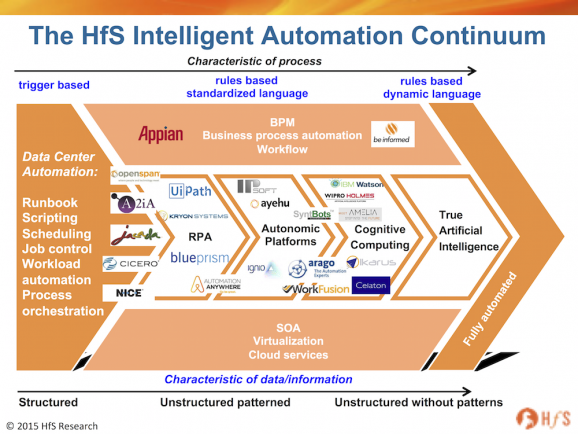 I completely agree with you that RPA is a small part of the continuum. I am with the BPO part of a large IT organization and truly believe that the investments that the parent is making in the Intelligent Automation space is well deserved and will be fruitful. I attribute the small divergence in views to probably the intended audience of your blog (users vs tech companies). OCR technologies have been in existence for donkeys years. A drop in OCR accuracy from say 98% to 90% could mean a 5-10 X increase in manpower requirements. As an operations person, I will aim at the optimum mix of tech & humans. BPOs should lead the techies on highlighting requirements or white spaces but should always lag a wee bit in implementation if they have to do justice to their clients and the SLAs. Phil, absolutely. At the recent RPA event the message was consistent. The transformation journey is made of many parts and not considering that whilst spending money on something as tactical as RPA will be big mistake. Rapid changes in digital transformation, IT re-engineering, cloud and big data are also having significant cost impacts on the cost of the workforce. We are firm believers in a transformation Center of Excellence and whilst often the COE "term" is banded around like every other acronym, it is more critical now that ever. ALL ideas for optimization, transformation, re-egnineering, Robotic Automation (Desktop and RPA) should come into a central group and decisively acted upon (correctly choosing the right technology). Rapid prototyping, fail fast, agile development are just as much game changers as the technology itself. Without a COE putting in some direction and control, all you do will be a band-aid - and indeed, we don't want to go there again. Great post Phil. Couldn't agree with you more and the blogs on our website fully support your views. The Intelligent Automation Continuum very succinctly shows the plethora of options available and goes some way to highlighting the confusion that exits - mostly due to the rush to value. We only work with organisations looking to build an Automation CoE because that's the only way they will derive the real value and avoid the mistakes and the unexpected disruption that will derive from piecemeal automations (nb Automation CoE's are small entities which pay for themselves) The irony is that the potential benefits are greater than even the market hype, but they are neither the benefits that are being flogged nor are they achievable through deploying one technology on a process by process basis. Very substantial and enjoyable read. All-to-often organizations are looking for a cost effective, rapid, and surgical fix to a much deeper wound that exists in their process(es). Realizing it is a holistic and transformative approach that requires the proper governance and management across the entire automation lifecycle is a requirement from the onset, otherwise those benefits will never reach maturity. It will be interesting to witness the changing landscape in coming years as RPA continues to gain purchase in the market. I believe there will be a disproportionate amount of failures to successes, and I suspect that a key differentiator to those success stories will be the implementation of CoE's. Great post Phil...really enjoyed it ! To your comment that many buyers and providers "didn't do enough the first time around", I suspect the your-mess-for-less model gave providers the opportunity to deliver the cost and quality gains buyers needed in the time period under focus. While some buyers probably/definitely left money on the table from deal years Y2 onward, many buyers DID do enough "the first time around" to achieve some/enough/most of their business goal. Then, since further incremental/transformational opportunities weren't as clearly defined or predictable as the original traunch, a new corporate project came along with higher predictability, teams were redeployed, and the original project now floats at ~40% realization. RPA will, I suspect, have many of the same tenets. Like your ERP comment, and your BPO comment, we've seen this movie too. We know how it ends. To me the question is: how can providers and buyers mutually get well past 40% before the next project starts ? Great post Phil! Many thanks. To build on what has been said, ... I see a lot of challenges in the business services domain these days... First, we struggle in general to define clearly what the value really is (shifting from cost-saving view to value creation mindset), %of cost saved every CXOs understands... Second, RPA is not transforming roles in the organizations much (yet to some degree yes), but cognitive automation will be a different story. I think most of the decision makers don't really comprehend that traditional job profiles will be transformed a lot, not to mention the fact that students are being prepared for the roles that will no longer exist.. And third, long-term strategies are difficult to craft and stick to in some organizations due to the instability of top management layers. Turbulent era comes with requests to immediate bottom line results which conflicts with broad and bold visions and committments. Only difficulty for any BPS player is client IT team is reluctant to agree to any change, though most of the Robotics works on layers and needs same access as the human. So what's "True Artificial Intelligence" then, and what are we going to use THAT for? I can hardly wait for the slew of marketing spank: TAI in the Cloud. TAIaaS. A whole raft of advisors helping clients to leverage TAI, to get the commercial model right, to transition away from RPA (so passe!) to the Brave New World of TAI. To five years of Analysts trying to agree what exactly TAI is (remember "Innovation"?) and finally, to getting it right this time. To taking the long view. Don't make the mistakes you made when you spent your miniscule Q3 budget, cobbled together your implementation of RPA and only saved 40% on your operational costs. Only 40%. What a waste. Great thing is, this time you won't make those mistakes. This time, the machines will get it right for you.